WeissCANNON has rapidly developed a well-earned reputation for providing a distinguished line of player's strings that offer distinct performance characteristics. After significant time in development and testing they have released their first prepackaged poly/synthetic hybrid combination. Like the entire line of WeissCANNON strings, the new Dual Reality delivers on court results that will delight serious tennis players. WeissCANNON challenges tennis players to"Rethink" their games by using this hybrid setup with some specific tension recommendations. Construction: This particular hybrid is designed to feature the poly based string in the mains. WeissCANNON is unveiling a new poly construction that is best described as "the polymer of the future." The cross string is an advanced polyamid (synthetic gut) that has been specifically designed to blend with the poly main to offer the best possible combination of power, touch and feel. Advantage: By playing with a prepackaged hybrid that has been specifically designed to work together, (not just two strings from the line packaged for convenience with little thought as to how they play together), players will immediately feel and appreciate the harmony of stringbed. By following the tension recommendations, the performance will appeal to a huge range of competitive league and tournament players. Tension Recommendations: WeissCANNON recommends a difference of 6 - 7 pounds between the mains and the crosses. In a midplus racquet they recommend the mains be strung at 49lbs and the crosses be strung at 55lbs. In an oversize racquet a recommendation of 53 lbs for the mains and 59 lbs for the crosses. 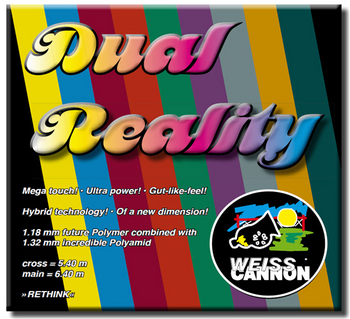 Why we carry this string: The Dual Reality is a hybrid that delivers an experience that is much different than other poly/synthetic hybrids. The relationship of the strings to one another and how they bring life to the racquet is remarkable. The funky 60's/70's packaging is symbolically appropriate because the Dual Reality hybrid combination brings peace, tranquility, unity and harmony to all phases of the game. I am a Physical therapist of 25 yrs who has treated many weekend warriors who write Vamos on their sneakers and string their rackets with hybrid or poly strings only to be reminded that they are over 35 and now have desk jobs. Seen many shoulder/elbow and wrist problems since the technology of strings changed. Always recommended the Explosiv to switch to during rehab for its arm friendly properties. But for those who really missed their hybrids, I couldn't find a string that I would recommend.. until now. Stringing a little lower then recommended (45/50), the blend and harmony of the two strings was immediately noticeable. The strings produce a good amount of spin, power, control and touch. But was most noticeable for me was how arm friendly this combination of strings is. None of the usual complaints associated with other strings. A string for any serious tennis player of any age. Weiss Cannon definitely put together a great hybrid package, but by doing so may put me out of business!!! Great string for the price. Very playable, great feel and easy on the elbow. A little less durable but I can live with that. I string this on my Donnay X-P Dual Black, 55# on crosses and 49# mains with really nice feel, pop and easy on the arm. The crosses break after about 10-12 times out on the court which is good enough for me as an arm-friendly string.